The seven years' war was over. The long contest for supremacy in America between England and France had ended in the surrender by the latter of Canada and all her western posts. The undefined territory of Louisiana, in the South, alone remained to her of all her former extensive possessions in North America. The first act of the great drama of American Independence had been played—a fact of which the chief actors themselves were profoundly ignorant. But while the conquest of Canada paved the way for the independence of the British colonies, it boded no good to the Indian. He saw his danger, and sought to avert it. The firm hold the French had taken on the affections of the western Indians had not been shaken by defeat. They still clung to them, and refused to believe that the hated English had conquered and that their old friends had taken final leave. This feeling was strengthened by the contrast between the courteous and attentive behavior of the French, and the insolent and brutal treatment received from the English soldiers who replaced them at the frontier posts. The former had supplied then regularly with guns, ammunition, and clothing; the withholding of these by the latter had brought upon them, as a consequence, want, suffering, and death. These evils had been largely increased by their introduction of the hitherto prohibited traffic in rum—"fire-water," as the Indians expressively called it. Glancing at the condition of the country beyond the settlements at this time, we find it—with the exception of an occasional Indian village—one vast forest. In it a human being, white or red, was rarely to be seen. Contact with the whites had changed, without improving the condition of the red man. The warlike Iroquois had declined in importance. Some of the Delawares and other smaller tribes dwelt upon the head-waters of the Susquehanna and the Alleghany, but the larger part of them lived upon the Beaver creeks and the Muskingum. The Shawnees were found along the Scioto; the Miainis, on the Wabash and the Maumee. The Illinois, once numerous and powerful, had, through intemperance, become scattered and degraded. Along the Detroit and near Sandusky were the Wyandots, whose industry and good husbandry had placed them foremost among the western tribes in civilization and progress. Albany, New York, was the largest town on the frontier. Traders and others, journeying to the region of the lakes, made this their starting-point. Ascending the Mohawk to Fort Stanwix, they would pass overland to Wood Creek, follow the windings of this stream to Oneida Lake, and crossing its western extremity, descend the river Oswego to the town of that name on the banks of Lake Ontario. From Philadelphia the route to the Indian country was over the Alleghanies, then descending their western slope to the valley of the Ohio. At the close of the war adventurous traders, transporting their goods on the backs of horses, regardless of the perils that beset them, pushed on over the mountains. They were a bold, rough set, and went well armed. Their wares consisted of blankets and red cloth, guns and hatchets, liquor, tobacco, paint, beads, hawksbills, etc. In Southern Illinois were to be seen the old French outposts, Kaskaskia, Cahokia, and Vincennes. Farther up the Wabash was Fort Ouantenon, whence a trail through the forest led to Fort Miami on the Maumee. Descending the Maumee to Lake Erie, one would have Sandusky on the right, or, farther north, through the Strait of Detroit, would pass Fort Detroit to the northern lakes. Farther east, beyond the Alleghanies, were Forts Presque Isle, Le Bœuf, and Venango. The conquered French inhabitants did all they could to influence the resentment of the Indians, and as they were being constantly pushed from their lands by an increased tide of English immigration, little was wanting to bring on another bloody Indian war. That little was soon supplied. Early in 1763 the red men were told that the King of France had given all their country to the King of England. Furious at this outrage, a plot of vast proportions was at once matured. The destruction of all the English forts and garrisons was to take place on a given day; the defenceless frontier settlements were to be swept away, and finally, as they hoped and believed, the English would all be driven into the sea. This has been, by a misuse of words, called a conspiracy; in reality it was a patriotic, though hopeless, effort on the part of the natives to free their country from a hated invader, and to avert the impending doom of the race. The leader in this great uprising was Pontiac, head chief of the Ottawas, then in his fiftieth year. With the Ottawas were confederated the kindred tribes of Ojibwas and Potawatomies. Pontiac possessed great courage, eloquence, and energy, more than ordinary mental powers, and was unmatched for craft and subtlety. He was of middle height, with a figure of remarkable symmetry. His complexion was unusually dark, and his features, though void of regularity, were expressive of boldness and vigor, which, united with an habitually imperious and peremptory manner, were sufficiently indicative of unusual strength of will. To these qualities, combined with the passions, the fierceness, and treachery of his race, was added a powerful ambition, and he had acquired great influence over the western tribes. He had fought on the French side during the war, and was said to have led the Ottawas at Braddock's defeat. In 1760 Major Rogers, with his Rangers, was sent to Detroit to replace the French with an English garrison. On nearing that post he was met by an embassy from Pontiac—"lord and ruler of all that country"—and directed to proceed no farther until the arrival of the chief himself. Pontiac soon appeared. "What is your business in my country, and how dare you enter it without my permission?" was the haughty demand with which he greeted the Ranger. Rogers told him his errand. Pontiac listened with attention, and with savage dignity exclaimed, "I stand in the path!" 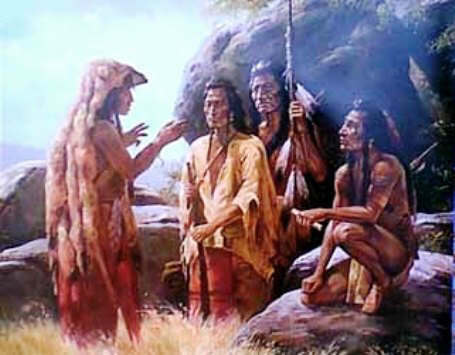 On the following day, however, the chief reappeared, and made a conciliatory speech; the pipe of peace was smoked, and harmony was apparently established. "I had several conferences with him," says Rogers, "in which he discovered great strength of judgment and a thirst after knowledge. He puts on an air of majesty and princely grandeur, and is greatly honored and revered by his subjects." Pontiac was too sagacious to believe that the English could be driven into the sea. His plan was to bring back the French, as a check to British encroachments. This idea had been held up to him by the Canadians, who told him that the armies of the French king, destined for the recovery of Canada, were already on the way. Acting upon this idea, he sent ambassadors, bearing the war-belt of wampum and the reddened tomahawk, 267 in token of war, to the different tribes. Those of the west accepted his message and pledged themselves to take part in the war. With the exception of the Senecas, the Iroquois confederacy was kept neutral by the strenuous exertions of Sir William Johnson. Up to the very moment of the outbreak the Indians succeeded in concealing their design. They continued, meanwhile, to hang around the posts, "begging, as usual, for tobacco, gunpowder, and whiskey." Detroit, near which were the villages of the Wyandots, Potawatomies, and Ottawas, was founded by the French as an Indian trading-post in 1701, and had at this time two thousand five hundred French inhabitants, dwelling on productive farms on both sides of the river. The fort was in the centre of the settlement, on the western margin of the river, and contained about one hundred houses, surrounded by a palisade twenty-five feet high and about one thousand two hundred yards in circumference; a wooden bastion stood at each corner, and each gate-way was protected by a block-house. It was garrisoned by about one hundred and twenty soldiers, and about forty fur-traders and employés. Some small pieces of cannon were mounted on the bastions, and two small armed schooners lay anchored opposite the town. On the night of May 6, 1763, Major Gladwyn, the commander of the fort, received secret intelligence that an attempt would be made the next day to capture the fort by treachery. The guard was weak, the defences feeble and extensive. Fearing an immediate attack, Gladwyn doubled his sentinels, and kept an anxious watch all that night. Next morning Pontiac, with sixty chosen warriors, each of whom was armed with a gun cut short so that it was hidden under his blanket, entered the fort. His plan was to demand a council, and, after delivering his speech, to offer a peace-belt of wampum. This belt was worked on one side with white and on the other with green beads. The reversal of the belt from the white to the green side was to be the signal of attack. Every Englishman was to be killed, but not a Frenchman was to be touched. The plan was well laid, and might have succeeded had it not been revealed to Gladwyn. The savage throng, plumed and feathered, and besmeared with paint, had no sooner entered the fort than they saw that their plot had failed. Soldiers and employés were armed and ready for action. Pontiac and his warriors, however, moved on, betraying no sign of surprise, and entered the council-room, where Gladwyn and his officers, all well armed, awaited them. "Why," asked Pontiac, "do I see so many of my father's young men standing in the street with their guns?" "To keep the young men from idleness," was the reply of the sagacious English commander. The business of the council then began. Pontiac's speech was bold and menacing, and his gesticulation vehement. As the critical moment approached, and just as he was on the point of presenting the belt, and all was breathless expectation, Gladwyn gave a signal. The drums at the door of the council suddenly rolled the charge, the clash of arms was heard, and the officers drew their swords. Pontiac was brave, but this decisive proof that his plot was discovered completely disconcerted him. He delivered the belt in the usual manner, and the council then broke up. The gates were again opened, and the baffled savages withdrew. Failing to capture the fort by stratagem, Pontiac next tried an open attack. A large war party of Ojibwas had joined him from Saginaw. Ottawas, Ojibwas, Potawatomies, and Wyandots, all had united, and came like an avalanche, yelling the warwhoop, naked, and painted for the fight. Sheltering themselves behind adjacent buildings, the Indians kept up an incessant fire for several hours. Some buildings within the fort were set on fire by their blazing arrows, but the flames were soon extinguished. Day after day they continued their attacks. No man of the beleaguered garrison lay down to sleep except in his clothes and with his weapons by his side. The two vessels in the river helped the defence, protecting by their fire the northern and southern faces of the works. The smaller one was despatched to Niagara for aid. Pontiac was determined to capture the fort, and omitted no means in his power to accomplish his purpose. Under the pretence of pacific negotiations he decoyed Captain Campbell into his camp. This officer, who had formerly commanded the fort, was favorably known to the Indians. Unfortunately for him, in a sortie from the fort, an Ottawa of distinction had been killed. The nephew of this Indian avenged his death by killing Campbell—an act disavowed and regretted by Pontiac. In order to compensate the French inhabitants of Detroit for the provisions he was forced to exact from them, Pontiac had recourse to a strange and novel, but successful expedient—one which reveals the native ability of the man. He issued promissory notes drawn on birch-bark, on which was a figure representing the article wanted, and signed with the figure of an otter, the totem or otter-graph of his family. These he is said to have faithfully redeemed. He kept two secretaries—one to write for him, the other to read the letters he received, and he managed to keep each in ignorance of what was done by the other. A supply of provisions and ammunition despatched from Fort Niagara for the relief of the garrison of Detroit was waylaid and captured near the mouth of the Detroit River. As the long line of bateaux came in sight, it was welcomed by a gun from the fort. It was soon painfully evident, however, that the convoy was in the hands of the enemy. The boats were rowed by English prisoners. The foremost had arrived opposite the larger of the two vessels anchored in the stream, when the soldier who steered her conceived a daring plan of escape. He knew that death, perhaps by torture, was to be his fate, and he saw one chance for life. Seizing the principal Indian, he endeavored to throw him overboard. A desperate struggle ensued; both were precipitated into the water, and went down together; the remaining Indians leaped out of the boat. The prisoners pulled for the vessel, shouting for aid, and were at once fired upon and hotly pursued. The light birch canoes of the savages gained rapidly upon them. One of the soldiers was hit by a bullet. Escape seemed hopeless, when a cannon-shot from the schooner skimmed along the surface of the water, narrowly missing the leading canoe. A second followed. This stopped the chase, and the fugitives reached the vessel in safety. The tortured and mangled corpses that floated past Detroit on the following day revealed the horrible fate which had befallen their fellow-soldiers. This surprise and capture was effected by the Wyandots. A month later the vessel which had been despatched to Niagara reached Detroit after a perilous passage, bringing a reinforcement of sixty men, and the supplies, of which they were greatly in need. While lying becalmed in the narrowest part of the river, a few miles above the fort, the Indians had attempted her capture. The captain, expecting an attack, had kept all but twelve of his men concealed below, keeping a strict watch from the time the sun went down. Hours passed, and the sentinels at length perceived dark objects moving upon the water. The men were quietly summoned from below, and noiselessly took their posts. The stroke of a hammer upon the mast was to be their signal to fire. When the Indians had approached sufficiently near, they were greeted with a sudden discharge of cannon and musketry, scattering death and destruction among them. Some of the canoes were sunk, and a number of the Indians were killed and wounded; the remainder fled in consternation to the shore. Some days later, with a favoring breeze, the vessel left her exposed position, sending a volley of grape into the Wyandot village as she passed, and finally anchored along-side of her companion at the fort. Pontiac made a determined effort to destroy these vessels by means of burning rafts filled with combustibles. Three times it was tried, without success, and the attempt was then abandoned. Some of the Indians, weary of the siege, now came to the fort and begged for peace. Treaties were made with the Wyandots and the Potawatomies, the latter restoring all their captives. The Ottawas and Ojibwas obstinately continued the siege. At the end of July, Captain Dalzell arrived, with a reinforcement of two hundred and eighty men, and having obtained the reluctant assent of Gladwyn, marched that night with a strong party to surprise Pontiac's camp. The plan was revealed by some Canadians, and the Indians prepared to receive him. A mile and a half from the fort, a creek, ever since called Bloody Run, descended through a wild and rough hollow, and was crossed at the road by a narrow wooden bridge. Beyond the bridge, intrenched and protected by strong picket-fences and wood-piles, the Indians lay in wait. While crossing the bridge, the advanced guard of the English were met with a sudden and murderous discharge, which shot down one-half their number. Cheered on by Dalzell, the troops charged over the bridge and up the heights beyond, finding no foe but seeing the flashes of their guns, and losing men at every discharge. Some lost their way in the darkness. Captain Grant, with his company, recrossed the bridge, and made a stand in the road. They soon discovered that the Indians had gained their rear, and that instant retreat was necessary. This, after much hard fighting, was at length effected, mainly by the skill and valor of Dalzell and Grant, the second in command, who was severely wounded. They had retreated half a mile when, reaching a point opposite an orchard and picket-fence, the Indians, who had gained their rear, rose from their hiding-places and poured a hot fire into their ranks. The troops were again thrown into confusion, but by the heroic efforts of Dalzell order was restored. Charging upon the Indians he dislodged them, putting them to flight, and then resumed his retreat. At the same time Major Rogers, with a party of Rangers, drove the Indians from a Canadian house, and, occupying it with his men, covered the retreat. Some of the regulars followed him in. Furniture was placed against the windows, and through the openings they kept up an effectual fire upon their enemies, which was sharply returned. Rogers's party was now completely surrounded, the other troops having reached the fort. Two armed bateaux were despatched up the river from the fort, and, opening fire upon the savages, Rogers and his companions were enabled to effect their retreat. In this action the English lost fifty-nine in killed and wounded. Captain Dalzell, who had been Putnam's companion in his campaign with the Rangers, and more recently aide-de-camp to General Amherst, was among the slain. He had displayed great bravery, but was shot down while heroically attempting to rescue a wounded soldier. The Indians were greatly elated at their success; Pontiac's force was soon largely augmented, and the siege was pressed with renewed vigor. Nothing of importance occurred, however, until the night of September 4th, when a gallant feat was performed by the master and crew of the schooner Gladwyn. She had been to Niagara with despatches, and was returning, having on board, besides the master and mate, a crew of ten men. That night, the wind failing, she anchored about nine miles below the fort. A vigilant watch was kept, but it was so dark that at a distance of a few rods nothing could be seen. Three hundred and fifty Indians, in their birch canoes, gliding silently and swiftly down with the current, were close upon them when discovered. The bow gun was fired, but the Indians were soon clambering up the vessel's side, holding their knives between their teeth. The crew used their small-arms with effect, and then seizing the spears and hatchets with which they were provided, met the savages with such determined courage that in a minute or two they had killed and wounded more than twice their own number. Some of the Indians understood the words, gave the alarm to their companions, and instantly leaped overboard in a panic, all the others following their example, diving and swimming for the shore to escape the threatened explosion. They did not dare to renew the attack, and on the following morning the schooner reached the fort without molestation bringing a much needed supply of provisions. The survivors of the crew were each presented with a medal for their bravery. This was the last important event of a siege whose long duration was a novelty in Indian warfare. On the approach of the hunting season the Indians dispersed, and although small parties hovered around, preventing the free egress of the garrison, yet the siege was virtually ended. Pontiac withdrew to the Maumee, intending to renew the war in the following spring. A few insignificant log-forts, widely scattered and feebly garrisoned, upheld the claims of England to the vast domain beyond the Alleghanies. The smaller garrisons consisted of an ensign and perhaps a dozen men. The weakness of this military cordon shows how slight was the fear of an Indian uprising. Yet no sooner was it known that Detroit was besieged, than these posts were, one after another, assaulted by the Indians, and nine out of the twelve were captured. Hostile Indians were discovered in the vicinity of Presque Isle in the middle of June. This fort stood near the site of the present city of Erie, on the southern shore of Lake Erie, and was commanded by Ensign Christie, a brave and gallant officer. At one of its angles was a large block-house, substantially built of massive timber, its upper story projecting several feet beyond the lower one. Into this block-house the garrison retired early on the morning of June 15th, abandoning the main body of the fort. To protect the roof from fire, a partial opening at its summit permitted water to be poured down upon it. Unfortunately there was a high steep ridge within forty yards of it, affording a cover for assailants. From this favorable point the Indians repeatedly succeeded in setting fire to the roof of the block-house, but the flames were as often extinguished by the heroic little garrison. Soon, however, their supply of water gave out, and with desperate energy they set to work digging a well within the block-house. Before a sign of water appeared the block-house was again on fire, when a soldier, at the risk of his life, ascended the roof and tore away the burning shingles, thus extinguishing it. During the night the well was finished. It was just in time. An adjacent building was discovered to be in flames, and they were communicated to the block-house, a corner of which at length burst into a sheet of flame. Water was passed up from the well, and the fire was once more extinguished. By midnight of the second day the men were completely exhausted by the long and desperate struggle. One of the enemy called out in French that further resistance was useless, as the fort had been undermined. Ensign Christie was assured that, if he would surrender, the garrison should be spared; if not, they would all be burned alive. Hostilities were suspended till morning, when Christie delivered up the post he had so gallantly defended, on condition that he and his garrison should be allowed to depart unmolested. Notwithstanding this stipulation they were seized, and sent to an Ottawa village near Detroit. Christie soon afterwards made his escape to the fort. The unfortunate officer who commanded at Sandusky was taken prisoner when that place was captured, and carried to the Ottawa village. He was beaten, and compelled to sing and dance all the way from the landing-place to the camp. The worst was to come. To cap the climax of his misery, he was compelled to take to wife an old squaw who had lost her husband. One of these outlying posts was taken in so ingenious a way, and one which so well displays the Indian's talent for strategy and deception, that it merits particular notice. On the margin of Lake Huron, at the northern extremity of Michigan, stood Fort Michilimackinac, a large square area with wooden bastions, surrounded by high palisades. As it was susceptible of successful defence, stratagem was necessarily resorted to for its capture. A Jesuit mission had been established here in 1671. It soon became an important centre of the fur-trade with the distant regions of the Mississippi and the north-west. Beyond the fort was a group of white Canadian houses, with strong picket-fences around them. The fort was garrisoned by thirty-five men. Within the palisades some thirty families resided, and without there were as many more. "Englishman, we are informed that our father, the King of France, is old and infirm, and that being fatigued with making war upon your nation he is fallen asleep. During his sleep you have taken advantage of him and possessed yourselves of Canada. But his nap is about at an end. I think I hear him already stirring, and inquiring for his children, the Indians; and when he does awake, what must become of you? He will destroy you utterly. "Englishman, although you have conquered the French, you have not yet conquered us. We are not your slaves. These lakes, these woods and mountains were left to us by our ancestors; they are our inheritance, and we will part with them to none. "Englishman, our father, the King of France, employed our young men to make war upon your nation. In this warfare many of them have been killed, and it is our custom to retaliate until such time as the spirits of the slain are satisfied. This is done either by spilling the blood of the nation by which they fell, or by making presents. "Englishman, your king has never sent us any presents, nor entered into any treaty with us, wherefore he and we are still at war; but for you, who came in peace to trade with us and supply our wants, we shall regard you as a brother, and you may sleep tranquilly, without fear of the Ojibwas." This tribe, on hearing the news that Pontiac had begun the war, were wrought up to a high pitch of excitement, and determined to attack the fort without letting their neighbors, the Ottawas, know their design. Captain Etherington, the commander of the fort, received repeated warnings of his danger, but disregarded them all. On the morning of June 4th, the king's birthday, the discipline of the garrison was somewhat relaxed, and many of the soldiers, without their arms, were outside the fort, watching a game of ball between the Ojibwas and the Sacs. The gates of the fort were open, and the officers themselves were witnessing the sport. A number of Canadian residents, traders, and fishermen, and many Indian squaws wrapped in blankets, were among the lookers-on. Indian chiefs and warriors were also apparently watching the game—in reality their thoughts were very differently occupied. Several bands of Ojibwas and Sacs who had recently arrived were encamped in the woods near by. In front, the field was filled with the players. The game, called baggattaway by the Ojibwas, and lacrosse by the Canadians, is an exciting one, and is a favorite with the tribes. A tall post at either extremity of the ground was the goal, or station, of the rival parties. The object of each was to drive the ball to the post of the opposing players. Each player had a bat about five feet long, with a hoop-net at the end large enough to hold the ball. All were nearly naked. The game was opened, as usual, by the ball being thrown into the air by some disinterested person in the centre of the field, when the contest for its possession began. Sometimes, while struggling for the ball, the players would close together in a dense mass, then they would scatter over the field in pursuit of it, all the while yelling and shouting at the top of their voices. Pushing and tripping their antagonists, or throwing them down, they kept up the contest, the spectators applauding and enjoying it almost as much as the players. Suddenly the ball was thrown towards the fort and fell near it. This was no accident, but a part of a prearranged plan for the surprise and capture of the fort. Rushing on as if for the ball, the noisy throng crowded through the gate-way, and were masters of the fort before the astonished garrison could realize the fact, or interfere to prevent them. The terrible warwhoop was sounded. The warriors grasped the hatchets their squaws had hidden beneath their blankets. Some assailed the spectators without, others attacked those within, and massacred them without mercy. Etherington and Leslie, his lieutenant, were seized and borne off; a few escaped the carnage, but in a few minutes all was over. Alexander Henry, who was an eye-witness, has left us an interesting account of this tragedy, and of his personal experiences during and after its occurrence. "The morning of the 4th of June was sultry. A Chippewa came to tell me that his nation was going to play at baggattaway with the Sacs, another Indian nation, for a high wager. He invited me to witness the sport, adding that the commandant was to be there, and would bet on the side of the Chippewas. I did not go myself to see the match, because, there being a canoe prepared to depart on the following day for Montreal, I employed myself in writing letters to my friends. Suddenly I heard an Indian war-cry and a noise of general confusion. "Going instantly to my window, I saw a crowd of Indians within the fort furiously cutting down and scalping every Englishman they found. In particular I noticed the fate of Lieutenant Jouette. "I had in the room a fowling-piece loaded with swan shot. This I immediately seized, and waited to hear the drum beat to arms. In this dreadful interval I saw several of my countrymen fall, and more than one struggling between the knees of an Indian, who, holding him in this manner, scalped him while yet living. At length, disappointed in the hope of seeing resistance made to the enemy, and sensible that no effort of mine could avail against four hundred Indians, I thought only of seeking shelter. Amid the slaughter that was raging I observed many of the Canadian inhabitants of the fort calmly looking on, neither opposing the Indians nor suffering injury, and from this circumstance I conceived a hope of finding security in their houses. "This was a moment for despair; but the next, a Pani woman, a slave of Langlade's, beckoned to me to follow her. She took me to a door, which she opened, desiring me to enter, and told me that it led to the garret, where I could conceal myself. I joyfully followed her directions; she locked the garret door after me, and with great presence of mind took away the key. "No long time elapsed before I heard some of the Indians enter the house in which I was. Through the flooring of single boards I could hear all that passed, and the Indians at once inquired if there were any Englishmen in the house. Langlade replied that 'he could not say, he did not know of any.' The Pani woman had kept my secret. Langlade, however, told them they might examine for themselves. Saying this, he brought them to the garret door. "The state of my mind at this moment may readily be imagined. Some delay was occasioned by the absence of the key, and a few precious moments were thus allowed me in which to secrete myself. In one corner lay a heap of birch-bark vessels used in maple-sugar making. "The door was unlocked and opened, and the Indians ascended the stairs before I had completely crept into a small opening which presented itself at one end of the heap. An instant after four Indians entered the room, all armed with tomahawks, and all besmeared with blood. "I could scarcely breathe, and I thought the throbbing of my heart occasioned a noise loud enough to betray me. The Indians walked in every direction about the garret, and one of them approached me so nearly that, had he at a particular moment put forth his hand, he must have touched me. Still I remained undiscovered, a circumstance to which the dark color of my clothes and the want of light—there was no window—must have contributed. After taking several turns in the room, and informing Langlade how many they had killed and how many scalps they had taken, they returned downstairs, and I, with sensations not to be described, heard the door, which was the barrier between me and my fate, locked for the second time. "This respite, however, was not of long duration. Next day Langlade, having ascertained my presence, and fearing for the safety of his family, delivered me into their hands. One of them, named Wenniway, whom I had previously known, and who was upward of six feet in height, had his entire face and body covered with grease and charcoal, with the exception of a white spot encircling either eye. "This man, walking up to me, seized me with one hand by the collar of the coat, while with the other he held a large carving-knife, as if about to plunge it into my heart, his eyes meanwhile fixed steadfastly on mine. After some seconds of most anxious suspense he dropped his arm, saying, 'I won't kill you.' To this he added that he had been frequently engaged in wars against the English, and had brought away many scalps; that on one occasion he had lost a brother whose name was Musinigon, and that I should be called after him. At my request, as the Indians were all mad with liquor, Wenniway consented that I should for the present remain where I was. "I had not been in my garret more than an hour when an Indian, whom I had seen before and who was in my debt, came to the house and ordered me to follow him to the Ojibwa camp, saying that Wenniway had sent him for me. I went, but instead of proceeding to the camp, the Indian turned in the direction of the woods. Suspecting treachery I refused to follow, and told him that I believed he meant to murder me, and that if so he might as well strike where he was as at any greater distance. He replied that he did intend to kill me, and to pay me in that manner for my goods. "Then drawing his knife, he held me in a position to receive the intended blow. By a sudden effort I arrested his arm, and gave him a push by which I turned him from me, and released myself from his grasp. I then ran for the fort with all speed, the Indian following me, I expecting every moment to feel his knife. On entering the fort I saw Wenniway, and hastened to him for protection. He interfered, but the other still pursued. At last I succeeded in reaching Langlade's house, and he abandoned the chase." Yet another freak of fortune was in store for our hero. He and other prisoners were being taken in canoes to Beaver Island, in Lake Michigan, when, a thick fog coming on, they were compelled to keep close to the shore. At Fore Point, when within a few yards of the land and in shallow water, one hundred Ottawas suddenly rushed upon them from among the bushes and dragged them to the shore with terrific shouts. "No sooner, however, were we fairly on our legs," says Henry, "than the chiefs of the party advanced, and, giving us their hands, told us they were Ottawas, and friends whom the Ojibwas had insulted by destroying the English without consulting them. The truth was they felt aggrieved at losing such a glorious opportunity for plunder. Soon we were embarked again in the canoes of the Ottawas, who relanded us at Michilimackinac and took possession of the fort. "Though we had changed masters, we were still prisoners and were strictly guarded. A council was held, the Ottawas were conciliated by presents, and we were once more in the hands of the Ojibwas, who declared that they intended 'to make broth of us.'" Henry's suspense, however, was soon to end. His friend and brother Wawaton now appeared, claimed him as a brother, and enforced his claim by a quantity of goods with which to satisfy his captors. It appeared that Wawaton, before leaving the fort, had received the promise of Minnevana, the great war-chief, to protect Henry, and that the chief, at the moment of the assault, had sent his son to find him and bring him to his lodge. The son went, but did not succeed in finding him. After numerous other adventures Henry reached Montreal in safety, and resided there until his death, in 1824. The fury of the Indians was not limited to the attack of stockades; they devastated the borders of Pennsylvania, New York, and Virginia, killing and carrying into captivity two thousand persons. A thrifty and independent population was suddenly reduced to beggary and despair. In July, Colonel Henry Bouquet, with five hundred men, marched to the relief of Fort Pitt, which had been beleaguered since May. It had been attacked with great spirit by the savages, who endeavored to set it on fire with lighted combustibles attached to arrows, and who, with their rifles, kept up a constant discharge at the troops from under cover of the bank of the Alleghany River. Captain Ecuyer, the commander of the fort, when summoned by the savages to surrender, was assured that if he would retreat to Carlisle they would protect him from some bad Indians in the neighborhood who thirsted for his blood; but if he stayed they would not be responsible for the consequences. Ecuyer, who fully comprehended Indian duplicity, thanked them for their "truly disinterested advice," but told them that "he did not care a straw for bad Indians, and meant to stay where he was; but," he added, "an army of six thousand pale-faces is now on the way hither, and another of three thousand has just gone up the lakes to annihilate Pontiac, so you had better be off. I have told you this in acknowledgment of your friendly counsels to me, but don't whisper it to those bad Indians, for fear that they should run away from our deadly vengeance." Though there was no truth in this story, it had its effect upon the Indians. A Swiss by birth, Henry Bouquet began his military career when a boy. He was active, courageous, and faithful, and had acquired a practical knowledge of Indian warfare. His present undertaking—a march of two hundred miles, through a wilderness filled with hostile savages—was one of great difficulty and danger, and his force seemed hardly sufficient for the purpose. Only a few years before, Braddock, in a similar attempt, with four times as many men, had met with an overwhelming disaster. Bouquet's order of march was as follows: In the advance were the Provincial rangers, closely followed by pioneers, who, with their axes, cleared the way. The wagons and cattle were in the centre, guarded in front, flank, and rear by the regulars. Another body of rangers guarded the rear. The riflemen, acting as scouts, ranged through the woods far in front and on either flank. In this order, through the heats of July, they toiled up the Alleghanies, and relieved the besieged posts at Bedford and Ligonier. When Bouquet arrived within twenty-five miles of Fort Pitt, he was attacked at a place called Bushy Penn by a large body of Indians, and a severe battle was fought, lasting two days. On the second day, when the troops, exhausted, dispirited, and distressed to the last degree by the total want of water, were about to give way, and the Indians, confident of success, were pressing them more closely, redoubling their yells and war-cries—at this moment, when all seemed lost, their commander, a cool and experienced veteran, by a successful stratagem, changed the fortune of the day. Withdrawing a part of his force from the front, he gave the Indians the impression that he was about to retreat. Leaping from their hiding-places, they rushed with fierce yells upon the thin line of English, and were on the point of breaking into the camp, when suddenly the troops that had been removed appeared upon their flank, and, after pouring in a well-directed fire, fell upon them with the bayonet. A similar movement, performed at the same moment by two companies upon the other flank, put the savages to flight. They were closely pursued by the troops, who gave them no time to rally or reload their rifles, and many of them slain. The loss of the English in this severe conflict was eight officers and one hundred and fifteen men. On this occasion the Indians displayed great firmness and intrepidity, but these qualities were more than counterbalanced by the steadiness and courage of the English. A few days later Fort Pitt was relieved. In the following campaign two armies were marched from different points into the heart of the Indian country. Bouquet advanced from Fort Pitt into the Delaware and Shawnee settlements of the Ohio valley, while Colonel Bradstreet passed up the lakes and penetrated the region beyond Detroit. The latter failed to accomplish anything of consequence, the former succeeded in overawing the hostile tribes, and compelled them to sue for peace and restore all their captives. In conducting this expedition to a successful termination, Bouquet showed himself well acquainted with the Indian character, and fully equal to the task of impressing them strongly with his ability to chastise them in case they attempted to cajole or deceive him, as they several times attempted to do. Seeing the kind of man with whom they had to deal, they had no alternative but to submit. He told them plainly that their excuses were frivolous, and their conduct indefensible, that they were all in his power, and that he could exterminate them, but that the English were a merciful and generous people, and that if they sincerely repented of their past perfidy and behaved well in future they might hope for mercy and peace. As a reward for his important services, Bouquet received the thanks of the Assembly of Pennsylvania, and the rank of brigadier-general from the King. The return of the English captives and the meeting of husbands and wives, parents and children, brothers and sisters, who had long been separated, and many of whom were supposed to be dead, presented a scene of thrilling interest. Even the Indians, taught from infancy to repress all outward signs of emotion, could not wholly conceal their sorrow at parting with their adopted relatives and friends. They shed tears over them, and earnestly besought for them the care and protection of the commanding officer. They offered them furs and choice articles of food, and even asked leave to follow the army home, that they might hunt for the captives and supply them with better food than that provided for the soldiers. The Indian women filled the camp with their lamentations and wailing both night and day. A tinge of romance is thrown around this remarkable scene. One young warrior had become so much attached to a Virginia maiden among the captives that he called her his wife, and persisted in following her to the frontier at the risk of his life. There was a darker side to this impressive picture. Among the Virginians and Pennsylvanians in Bouquet's army were many who had joined in the hope of recovering their lost loved ones. While some were filled with joy and rapture, others with anxious and troubled looks were flying from place to place, with eager inquiries after relatives and friends, trembling to receive the answer to their questions, distracted with doubts, hopes, and fears, on obtaining no news of those they sought for, or stiffened into living monuments of horror and woe on learning their unhappy fate. "Father," said the chief, "we have brought your flesh and blood to you. They have all been united to us by adoption, and although we now deliver them, we will always look upon them as our relatives whenever the Great Spirit is pleased that we may visit them. We have taken as much care of them as if they were our own flesh and blood. They are now become unacquainted with your customs and manners, and we therefore request you to use them tenderly and kindly, which will induce them to live contentedly with you." What a pang must have invaded that mother's breast who recognized her child, only to find it clinging more closely to its Indian mother, her own claims wholly forgotten? Some of the children had lost all remembrance of their former home, and resisted when handed over to their relatives. Some of the young women had married Indian husbands, and with their children were unwilling to return to the settlements. Indeed several of them had become so strongly attached to their Indian lords and to their mode of life that they made their escape and returned to the wigwams of their husbands. "Sing the song you used to sing to her when a child." The mother sung, the child's attention was instantly fixed, a flood of tears proclaimed the awakened memories, and the long lost child was restored to the mother's arms. Pontiac endeavored, but in vain, to secure the assistance of the French in his efforts to continue the war. In the spring of 1766 he made a treaty with Sir William Johnson at Oswego, and submitted to the English, renouncing forever the great scheme he had so long meditated. His death occurred at Cahokia, where he was murdered by an Illinois Indian, who, it is said, was bribed with a keg of whiskey by an English trader to commit the deed. This murder, which aroused the vengeance of all the tribes friendly to Pontiac, brought about the successive wars and almost total annihilation of the Illinois nation. The dead chieftain was buried with the honors of war by his friend, St. Ange, the French commandant of St. Louis. This story of Pontiac's War is featured in the book entitled the Indian History for Young Folks by FrancIs F. Drake and was published by Harper Brothers in New York and London in 1919.